Some of our enthusiastic Owners Club members got together and put together this agility section to share their advice and experiences. I have been involved in competitive agility for about 15 years. Eight years ago my son Ashley and I started a club called Paws On Dog Training. 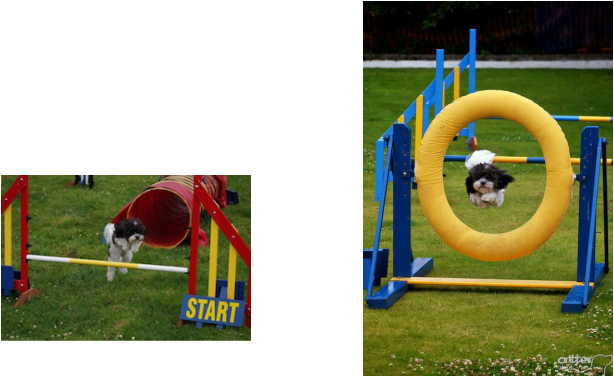 Although we love training our puppy, obedience and trick work classes, our passion is agility. Helping people to get the very most enjoyment out of their dog must be a dream job for all dog lovers and believe me, I love my job. Everything we teach is done with fun in mind. I don't believe in forcing a dog to do anything. Our dogs work because they want to and it's our job to make sure they want to! If someone asked me what makes a good dog trainer a good sense of humour would be very near the top of my list together with patience, consistency, common sense, sensitivity and enthusiasm. I have three dogs of my own. Fly is a 12 year old Working Sheepdog. She came to me as a 6 week old puppy. OMG! This was a dog like no other I had ever owned. She had issues! This was most definitely a working dog. After a year of lots of obedience training, trick work and heelwork to music we began our agility training. Fly gave 110% in everything we did together and agility was no exception. I don't compete very often. Don't like getting up at stupid o'clock, don't like driving and don't like waiting around all day for three or four runs. In the few competitions we did Fly took me to Grade 5 before her agility career was cut short by a prolapsed disc. Faith is a six year old blue merle Border Collie. She is my son's dog really and competes regularly with him at Grade 6. Mud is my three year old Border Collie. He and I compete at Grade 3 (although we have only competed twice due to my aversion of getting out of bed). He is a clown and best described as work in progress. Agility training is suitable for anyone who owns a healthy dog. Our classes consist of a broad spectrum of people from all walks of life with one thing in common – they all love their dogs. Only around 20% of our members choose to compete. The rest come because they simply enjoy it. Just because you do it doesn't mean you have to live it or be brilliant at it. Just enjoy it! It's social too. The same people come to the same classes each week so they get to know each other and many socialise away from training. Florrie was born on 31st October 2009 & started puppy agility classes in May 2010 when she was 7 months old. She obviously couldn't go on all of the equipment until she was 12 months old, but it got her used to following the commands & was a great focus & way of using up puppy energy! Once she was 12 months old, she was able to progress to doing the full course & she just loves it. She is only tiny, but those little legs can move fast. We are members of Sutton Weavers Agility Club, where we train & each month, have a competition night which is great fun, though the courses are getting tricky! At the last competition in February, she got a 1st place in agility & 2nd place in jumping, which we were really pleased with. We also do agility displays with the club through Spring & Summer at various events, which is lots of fun & it's great for people to see so many different dogs taking part. We are going to register Florrie on the Kennel Club activity register so that we can enter some more competitions, which I'm sure will be a big learning curve. Both myself & my husband Lee run Florrie & we love it as much as she does. It's great exercise & a lovely way to bond with your dog as they really do focus on you for what to do next, as well as meeting lots of lovely people & dogs. On a cold winter’s morning I had arrived with Murphy for our very 1st agility session, I’m not sure who was more excited Murphy or me! I had decided that I wanted to have a go at agility and had waited 12 months until we were able to start… so being excited was ok by all accounts! I started puppy socialisation classes with Murphy at 10 weeks old and continued with on-going obedience training where we worked on basic commands, all of which would prove to be useful in agility training. We were fortunate in that Julie Peach our trainer taught both obedience and agility which meant training was consistent. On the field we were split into 2 groups and our group consisted of just 4 people and their dogs. Julie had already explained that we would be taking it really slowly as we needed to introduce each obstacle carefully, taking our time and trying hard to make sure Murphy was comfortable with what he was doing and we were not putting him under any pressure… he needed to enjoy it! We started off with a medium height jump. I placed Murphy in a sit position and reinforcing the ‘sit’ and ‘wait’ command on the start line, we then introduced and worked on the ’over’ command. Murphy seemed at home with the jumps and even pulled in a couple of extras in his excitement! We then introduced Murphy to a straight rigid tunnel, at first he was a little cautious and perhaps confused as to why we would be asking him to go through when he could just as easily run round it or jump on top! A little gentle persuasion by me at one end and Julie at the other and coaxed by a tasty treat did the trick and so the tunnel had been introduced with ease! Seeing that Murphy was now comfortable with the straight tunnel, we then changed it to a curved one, this meant that Murphy would need to go into it not being able to see the exit at the other end… again after some gentle coaxing and more treats Murphy was fine and whizzing through! Julie told me that it sometimes takes 2 or 3 weeks to get to this stage with the curved tunnel, so Murphy was doing really well. Next we tried some weaving, again taking it very slowly. Murphy again did very well although keeping him at the right pace and making sure he stayed within the weave poles was not the easiest of things with an excited Cockapoo. Another tasty treat was enticing though and helped to keep him focused. Note to myself here… Murphy must enter the weave with the first pole on his left!! Next up was the ‘A’ frame and the dog walk. Both of these obstacles were carried out ‘assisted’ as Julie again said it was important that Murphy took it slowly, built up his confidence and didn’t cause injury by falling or jumping off. With Julie at one side and me on the other Murphy was walked along ‘the walk’ lightly held by his collar, he wasn’t phased by the height and at the bottom he found another tasty treat for ‘touching’ down… ‘Touch’ being another useful command already practiced at obedience training sessions. Murphy also loved the ‘A’ frame! Without any persuasion whatsoever he very enthusiastically zipped up and over and down the other side with ease… leaving me standing!! Was great to see him gaining in confidence whilst at the same time having so much fun! Dylan was born on 24/11/09, so was ready for agility training about Oct 2010 when he was 11 months. I bought Dylan with agility (and canoeing) in mind, so started at obedience classes when he was 10 weeks old. I told John (Club FALDO) that I wanted to do agility so what should I teach him. Wait and getting Dylan to listen to me was the answer. Every week we went to obedience class and longed to start agility training. In Oct 2010 John informed me he had a starter course starting on Tuesday nights in Barton-le-Clay – did we want to come – Yes please!! To compete (which I wanted to do) I needed to register Dylan with the Kennel Club for agility as obviously he isn’t a pedigree! I also needed a Kennel Club Agility Record Book, which I was able to buy from John at the club. So on 9th April 2011 I went along to a KC show at Shuttleworth to get Dylan measured. He was 15 months old (the youngest they can be measured) and so he was declared as medium. Dylan will need measuring again 12 months after his first measure but before 24 months afterwards. Training was going well, although the weaves were still difficult. However we were ready to compete. Advice from Jackie (my trainer) suggested that the BATS show at Luton would be a great first show, but unfortunately Dylan would quite be 18 months then (2 days off! ), so we registered for the JDA show at Shuttleworth on 1st June 2011. It was overwhelming as there were so many rings, but I had lots of encouragement from club members and we competed in eight runs over two days and went clear in three of those. We had won the Medium Jumping Combined Grade 1-2 (meaning grade 1 & 2 compete against each other) much to my surprise! From there we competed in at least one competition each month through the summer. Dylan got used to the show ring and wasn’t always well behaved. We had bucket incidents at a number of shows! He had worked out that buckets were exciting because often his lead was there. Jackie included buckets in training and I would ask that any buckets were hidden during show runs. He’s okay now!! Some shows I attended we camped at (use for my Mazda Bongo campervan came into its own! ), met loads of lovely people and watched loads of much better than us dogs and handlers. We got another win at the KC International Show on 14th August 2011 in a jumping class. With 2 jumping clear round wins we only need 1 more jumping win (clear) to be promoted to Grade 2 or an agility win with a clear round. We have had an agility win at Rugby on 10th Dec 2011, but we had 10 faults so although we got a rosette and a trophy we didn’t gain promotion! Throughout the winter we have competed at an independent show at Keysoe run by Barking Mad. 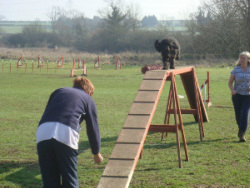 Each month we had a day of runs, 1 jumping and 1 agility run were qualifiers for the final in March. We won either jumping or agility each month and often did well in the other runs too. Being top of the Grade 1-2 medium dogs we were in the final in March 2012. That day despite winning an agility run and a jumping run, the excitement of the final was too much and 1 made an error so 5 faults meant we didn’t win! So our first KC agility show of 2012 loomed ... Dog Vegas in Grantham. We had 4 runs to look forward to. First a jumping round which only had 13 obstacles. It was over so quick ... were we quick enough? No beaten by 0.2seconds into second place. Next an agility run ... we were clear & fast ... our first KC agility win ... our promotion win. We went on to win the next agility run as well and were eliminated from the third!! 25 days needs to pass after “winning out” of one grade to the next. We were at Dog Vegas in Winterton, Lincolnshire for 5 days over Easter, winning 3 agilities and 3 jumping rounds. Our first Grade 2 competition was at Shuttleworth over the weekend of 14/15th April (a full year since Dylan’s first measure). Saturday saw 3 clear rounds and 3 places including a jumping win ... on the road to the next promotion. Murphy's first attempt on the dog walk.